It’s been an eventful literary year! So many series begun and ended. So many promising debut authors, and old favorites offering up new works. The Young Adult genre has been a particular treasure trove. Thanks largely to my assignments through YA Books Central, I’ve read and reviewed more than 80 books over the last 12 months. I’ve also had the great pleasure of stumbling across several that stayed with me throughout 2016. And now, I’d like to share with you my top 2 picks! Because books are kind of like potato chips. It’s hard to pick just one. Review: A captivating gem of a story—an absolute treasure. I hated having to put it down to attend to ‘real life,’ and relished the joy of picking it back up again. 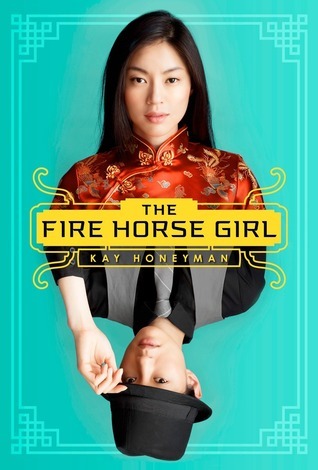 Fire Horse Girl is a highly accessible (and subtly informative) YA historical, steeped in 1920’s Chinese culture, integrated folklore, deft wit, and poignantly beautiful prose. The tale is told entirely from the 3rd person perspective Jade Moon, a 17-year-old girl whose gender and birth year (according to the Chinese zodiac) leaves her shunned by her village and family—a pariah in a culture that openly considers her “cursed.” When a family business arrangement gives her the opportunity to go to America, Jade Moon is enchanted by the hope of a fresh start in a country where people seem free to make their own luck. But immigration proves difficult and dangerous. Jade Moon’s hopes run aground on the obstinate will of her both her father and Sterling Promise—the young man she’s grown to care for but cannot trust. And her only remaining option may be to defy everything she knows to carve out a place for herself in a world she doesn’t yet understand. This reader connected with Jade Moon almost immediately. She is what Americans would generally deem a classic ‘Tomboy’—an innately willful, indelicate, opinionated, big-dreaming, and brash young woman. In short, a force of personality to be reckoned with. And of course, none of these traits were considered desirable of a female in Chinese culture at the time. But though she is hurt and isolated by her immediate world’s inability to accept her, her spirit isn’t completely crushed—and she grabs fiercely at hope for change the moment it comes near. While some readers may not have as much sympathy for a more aggressive female character, I understood her so deeply it hurt. Jade Moon is every girl who has ever felt like they were too much for anyone to handle. She is every girl who knows they are too bold or temperamental, yet can’t seem to help it. She is every girl who would rather risk the consequences of breaking the socio-cultural mold than to allow the mold to break them. Obviously, one needn’t be Chinese to be a Fire Horse kind of girl. Then there’s Sterling Promise… whose name couldn’t be more fitting. While his personality is nothing like Jade Moon’s, his hopes and goals are very much the same. He is an orphan, forced to grow up working in a sweatshop before being adopted by a man who’d estranged himself from his own family. Like Jade, he belongs nowhere and to no one. Like Jade, he sees America as his chance to start life anew. He’s a level-headed, silver-tongued survivalist—skilled at talking his way in and out of situations. And while he comes to care for Jade, he remains an enigma for much of the story—a wild card. Both Jade and readers are never quite sure if will do the right thing in the end… or if he’ll go no further than doing what is right for himself. This book hit literary happiness buttons I didn’t even know I had. I’m always excited about a strong female MC and cultural/historical insight that’s done well enough I don’t notice how much I’m learning… but I’d forgotten how much I appreciate co-experiencing the challenges of a female who is compelled to cross-dress (for survival, not fun), or a romance that initially doesn’t work because one or both parties realizes that, while the other does love them, they don’t love them enough. Though there is a thread of hate-to-love romance, it takes a far backseat to the greater storyline. The ending is balanced and satisfying. While the book stands perfectly on its own, it also leaves open the possibility for more of Jade Moon’s story at some later date. Thank you, Kay Honeyman, for such a remarkable work of heart. Books like this remind me why I love to read. TAKING FLIGHT is both potent and potentially worldview-expanding. Whether you’re interested in ballet or not, this YA memoir is a stirring must-read. Let me start out by saying that this reader, personally, has no particular interest in dancing of any kind. But when I came across a news article several years ago detailing some of Michaela DePrince’s life, I was immediately drawn in. Her background and force of personality were uniquely captivating, and her physical ability was ethereal. I had to know more about her. This memoir provided exactly the resource I was hoping for to that end. Micheala DePrince’s life story begins in a war-torn Sierra Leone—a brilliant, headstrong child born to doting parents who are in the severe cultural minority in regard to their value for the female gender. Tragically losing both of her parents proves to be only the beginning of her hardships. Micheala’s spotted skin pigmentation marks her as a “devil child” and she suffers tremendous abuses at the hands of cruel and superstitious caretakers—beginning with her own uncle and continuing on as she becomes the least-favorite child at the orphanage she is sold to. She somehow survives horrific war violence, trauma, neglect, starvation, disease, abuse, and the brutal misogyny of Sharia Law—before being adopted by a big-hearted American couple at the age of 4. And a chance encounter with a magazine cover (featuring a prima ballerina) becomes an unlikely focalpoint that hones her new life. Michela DePrince’s mere survival defies all probability. The fact that she has also excelled in drive and discipline to the point where she is currently a renowned classical ballerina with the Dutch National Ballet is beyond inspiring—bordering on the miraculous. DePrince’s writing is strong, straightforward, and devoid of frills—effective and sometimes blunt in conveyance. She lays out her story like dance steps. Precise and intentional, acknowledging pain without faltering or dwelling on it any longer than necessary. The first 70 pages are dedicated to sharing her pre-adoption childhood, and while the content is often difficult to read, it makes her current triumph all the more sweet. Her challenges don’t end simply because she’s given 1st-world opportunities. Instead they change form—appearing in her initial struggles with adapting to her adoptive country, in the heartbreak of losing a beloved sibling, in the effects of residual PTSD, in her own self-consciousness over her skin condition, and eventually in confronting the many faces and forms of racism in everyday life as well as the realm of professional ballet. I’ve noted some reviewers take issue with the credibility of DePrince’s memories from the age of 3-4 while she was still in Sierra Leone. But considering she could read and write by age 3 and spoke five languages (thanks to both her biological parents’ attentiveness and the nature of their merchant livelihood), the degree of trauma she endured, and her exceedingly advanced talent and aptitude in spite of all odds, this reader can’t see any reason to find fault with her recollections. If anyone is a clear exception to the norm, it is this astounding young woman. Highly Recommended For: Anyone and everyone. Don’t wait to get a hold of this book. Come and dance a mile in this girl’s pointe shoes. 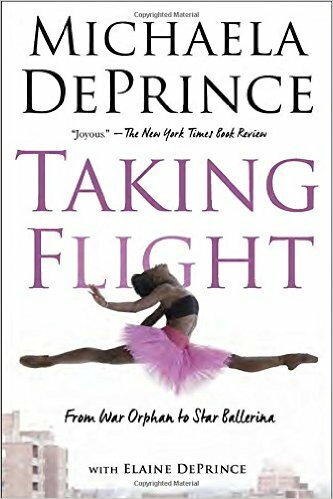 DePrince’s story doesn’t merely fly, it soars. Tell me your favorite ready of 2016!